Electrical motors are the machines which convert the electrical input to the mechanical energy. All motors are made up of a stator (the stationary part) and the rotor (the rotating part). As motor runs on electricity, there are various properties which are associated with its working. Such properties include a number of poles, speed, frequency, slip, starting current and rated horsepower. 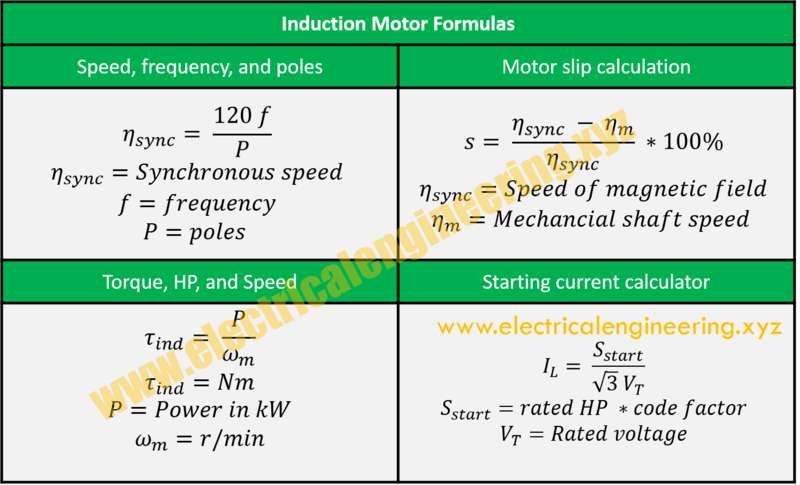 Previously we shared the book on AC Motors which explains all these properties briefly, this post is focused on the induction motor formulas and calculation examples. Calculation: Find the synchronous speed of 4 pole induction motor which operates at 60 Hz. Calculation: The rotor speed of a 4 pole induction motor at 50 Hz is 1200 r/min. Calculate its slip. Calculation: Find the shaft torque of the 10 hp induction motor whose rotor speed is 1500 r/min. Calculation: Find the starting current of 10 hp, three phase 220 V A class motor. Solution: The maximum kVA/hp for A class motor is 3.15 (code factor).